José Suarez does not have any MLB stats for the season. José Rances Suarez... Named by Baseball America as having best changeup in Angels system following 2017 and 2018 seasons... Originally signed by Angels scouts Carlos Ramirez, Mauro Zerpa and Lebi Ochoa. Opened year with Adv.-A Inland Empire and was promoted to Double-A Mobile after two starts...Made seven starts for BayBears before joining Triple-A Salt Lake in late May... Recorded 11 strikeouts in each of final two starts for BayBears... Named Angels Minor League Pitcher of the Month for April, after combining to go 1-1 with a 2.49 ERA (21.2 IP - 6 ER) and 36 strikeouts across five starts for 66ers and BayBears...At time of promotion to Triple-A, had recorded 69 strikeouts in 38.2 innings (15.8 strikeouts per nine innings)...Had fanned 42% of all batters faced, which ranked second in all of Minor League Baseball...Combined 142 strikeouts and 10.9 strikeouts per nine innings rate led all Angels minor league pitchers (min. 100 IP)... Ranked fifth in organization in innings pitched... Enters 2019 ranked by Baseball America as #4 prospect in Angels organization...At conclusion of 2018 season was ranked by MLB.com as #8 prospect (#2 among pitchers) in Angels system... Selected to Angels 40-man roster, Nov. 20. 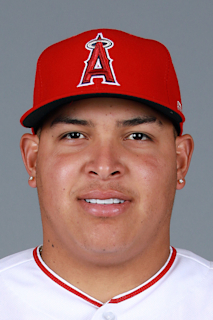 March 10, 2019 Los Angeles Angels optioned LHP Jose Suarez to Salt Lake Bees. November 20, 2018 Los Angeles Angels selected the contract of LHP Jose Suarez from Salt Lake Bees. May 27, 2018 LHP Jose Suarez assigned to Salt Lake Bees from Mobile BayBears. April 18, 2018 LHP Jose Suarez assigned to Mobile BayBears from Inland Empire 66ers. April 2, 2018 LHP Jose Suarez assigned to Inland Empire 66ers from Burlington Bees. August 11, 2017 LHP Jose Suarez assigned to Burlington Bees from AZL Angels. July 19, 2017 LHP Jose Suarez assigned to AZL Angels from Burlington Bees. June 10, 2017 LHP Jose Suarez assigned to Burlington Bees from Orem Owlz. September 3, 2016 Jose Suarez assigned to Orem Owlz from AZL Angels. August 4, 2015 LHP Jose Suarez assigned to AZL Angels from DSL Angels. May 29, 2015 LHP Jose Suarez assigned to DSL Angels. July 3, 2014 Los Angeles Angels signed free agent LHP Jose Suarez to a minor league contract.